The flowers were piled high in the chapel on Broadway at noon on the 26th of October. Don Almy, badge 12081, lay among them, sleeping his last, as family and friends gathered around mourning their loss as they paid tribute to a glorious life. The comforting strains of "Abide With Me," the religious service and the fraternity ritual all together were not adequate to express the feelings of those present, yet a clue to the lasting influence of their departed brother might have been found in those words in unison by voices that faltered with a note of love and farewell; words from the ritual ceremony which every brother knows by heart. Don was taken away in the prime of his usefulness at 53. An outstanding member of the New York Bar, gifted orator, devoted husband and father, this friend and brother to thousands had won the highest honors of the fraternity world and had worked his way through a position which insured comfort for his remaining days. 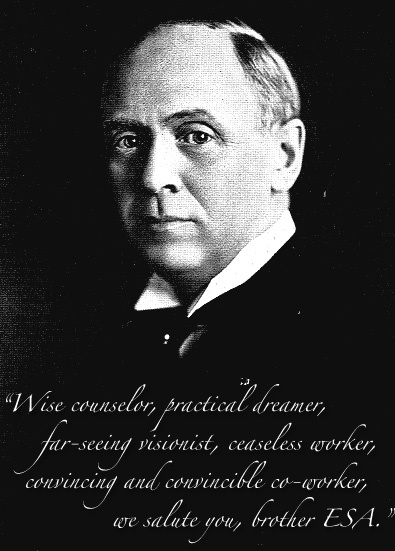 His quality of leadership had been revealed during early college days, with the class of 1896 at Cornell. He helped New York Alpha through early vicissitudes and came back year after year to put his shoulder to the wheel and inspire everyone in the chapter with his high ideals. He lived to see some of the results of his own and other national fraternities. He was elected eminent supreme archon and honorary eminent supreme archon of SAE and was chosen also president of the Interfraternity Conference, an organization with which he worked actively on the executive committee until the last. An indication of the way he worked is found in one of his activities while president of the conference. A number of locals were petitioning national fraternities all over the country and most of these were faced with a long period of waiting before they could hope for admission. 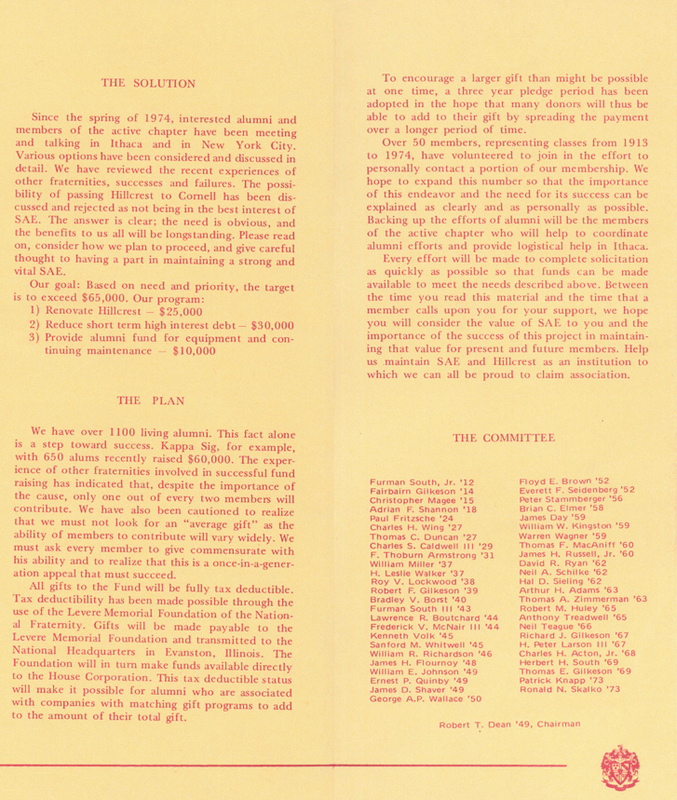 Don called them together and showed them how to organize their own national fraternity, which they did. Click here to read the whole story from the Record. Don Almy was a practical dreamer, a liberal, unselfish friend. He spent his time and his money freely in support of the things that appealed to him. He was a leader by persuasion and example. He seemed always to give to the other fellow the first chance and never tried to be dominant, but his honesty, unselfishness, personal charm, and intellect made many more pretentious men seem small beside him. We have known him to shine as he stood before large and exclusive gatherings but he was at his best, perhaps, and happiest when lounging around the chapter house, talking to the freshmen in their own language, and bridging the gap between the undergraduate and alumnus. All of Don's friends who have seen him in his recent years know how happy he was at home. As I sat with him at this year's Founder's Day banquet, he told me he had married "the finest woman in the world" and then went on to say more about plans he was making for Tom, his boy. All of us remember the things Don has said, reflecting his own character or influencing something that we have done or hoped to do. Several years ago, in Europe, I happened to mention his name while talking with a man from New York. Don was an old friend he said. I asked if he had seen him or heard from him recently. "No," he said, "Don does not know where I am. He helped me get started again when I was discouraged and having a mighty hard time. When I go home, I want to repay him by giving him a good account of myself." We know of many good things that Don Almy did, but we are sure that many more are known only to the objects of his kindness and generosity. Always modest, he found enough reward in the consciousness of a good deed. He had the courage to go down into the depths with a comrade and the will to rise with him to the heights far beyond the vision of any opportunist or poseur. In his relations with our own and other college fraternities, he found a medium through which to express his real character. His conception of brotherhood embraced all classes, the strong forever helping the weak. He knew men and the limitations of the workaday world, but he knew also how to "follow where airy voices lead." We are thankful for the fate that guided us, even for a little while, into the same path with Don Almy, and we shall find inspiration in the thought that we have walked with a prince among men. Don Robinson Almy, who died on October 23 at his summer home in Redding, Connecticut, was born in Grand Rapids, Michigan, March 24 1874. He spent his boyhood in Jamestown, New York, and entered Cornell University with the class of 1896. He was initiated by New York Alpha of Sigma Alpha Epsilon, January 20, 1894. At the close of his junior year, he obtained a year of absence and returned to college in 1896, graduating, A.B., in 1897, and L.L.B., in 1898. In college, he was active in undergraduate affairs, being a member of glee club, the law fraternity, Phi Delta Phi, and various committees and honorary clubs. Brother Almy returned to Ithaca as an alumnus to help his chapter carry out its plan for building a new house of its own. He was a liberal contributor to the fund, besides serving as an active director and as president of the New York Alpha Association. He conceived a system of accounting which was first installed at the Cornell chapter and later adopted by the national fraternity. He advocated also the central business office, now so successfully operated in Evanston. He was elected eminent supreme archon at the 1914 convention, serving two terms during which the fraternity made great progress under his leadership. 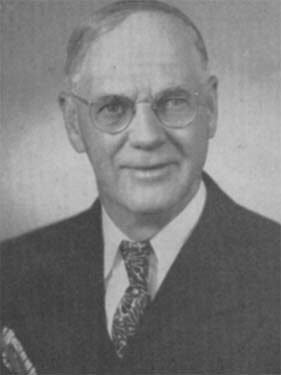 Following his term of office as ESA, Brother Almy was elected president of the Interfraternity Conference; he was a member of the executive committee of the conference until his death. He was elected also to the office of honorary ESA of SAE. He helped organize the SAE Diomedian Society in New York. He was the author of "Fables of the Student Life," an anonymous series that ran in The Record. He was a popular speaker at SAE and interfraternity gatherings, two of his latest appearances having been at the SAE national convention banquet in Boston last December and at the interfraternity banquet in New York several months later. The funeral at Campbell's Funeral Church, New York, October 26, was attended by the entire SAE Board of Trustees and several ex-members of the board besides representatives of the Interfratenity Conference and many SAEs and other intimate friends and admirers. The internment was at Rose Hill Cemetery, Chicago, on the following day, with members of the Supreme Council, SAEs from nearby chapters, and representatives from other fraternities in attendance. The service at the grave was simple but impressive. 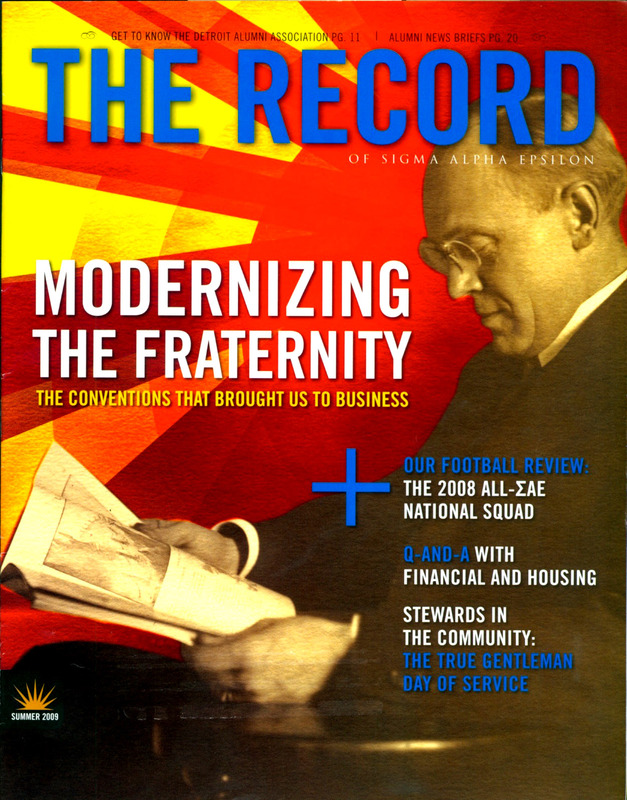 Judge Alfred K. Nippert, speaking for the Supreme Council, spoke on the magnificent work of our departed brother as an outstanding leader of the fraternity. Judge Arthur J. Tuttle, speaking for the fraternity at large, told of the devotion, love, unselfishness, and magnanimity of the personality of the perfect fraternity man that was Don Robinson Almy. After graduation from college, Don Almy joined the legal department of the Metropolitan Street Railway, New York, and within three years became assistant solicitor. Two years later, he resigned to practice for himself. He was senior member of the firm Almy, Van Gordon, and Evans, 46 Cedar St., New York, until shortly before his death, when he left the firm to open his own office. He was the author of "Taxation of Imports Under Tariff Acts," and a director of the First National Bank of Croton-on-Hudson. He was a mason and member of the Bankers, Manhattan, Cornell, and Leewood golf clubs. On October 7, 1907, Brother Almy married Miss Marie Pattison, who survived him with a son, Thomas (who also became an SAE at Cornell, class of 1935). Don Almy's loyalty to the fraternity and interest in its work are all the more remarkable when one learns that his days as an active member were comparatively limited. He initiated at Cornell in the spring of his sophomore year, and in his junior year, the chapter failed to muster a sufficient chapter roll to justify continuing and was dormant during the remainder of his college course. In this short time, however, he caught the spirit that held him in later years. While taking a postgraduate course, he assisted in reviving the chapter and participated in the re-installation ceremonies. As an alumnus, he took active interest in the chapter. 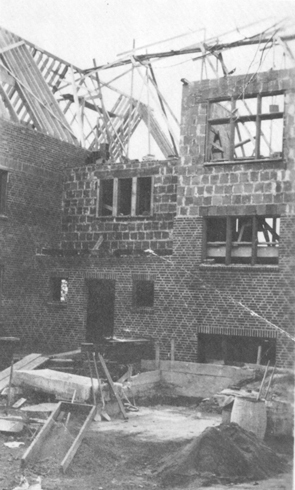 To him, as perhaps to no other, is due credit for conceiving the idea of incorporating the house building association, with the issue of bonds and other features that have made the New York Alpha chapter house building plan both unique and successful. He was one of the incorporators of the New York Alpha Association, has been on the board of directors since the beginning, and was the second president. Only once, and then on account of sickness, did he miss going back to Ithaca for the annual meeting. His efforts as an alumnus were not restricted to his own chapter. He was a frequent contributor to Phi Alpha, and his utterances were characterized by an advocacy of new or improved plans for enlarging the fraternity and building it up. He was among the first, if not indeed the first, to suggest and support the centralization idea as the method on which the fraternity business should be conducted. 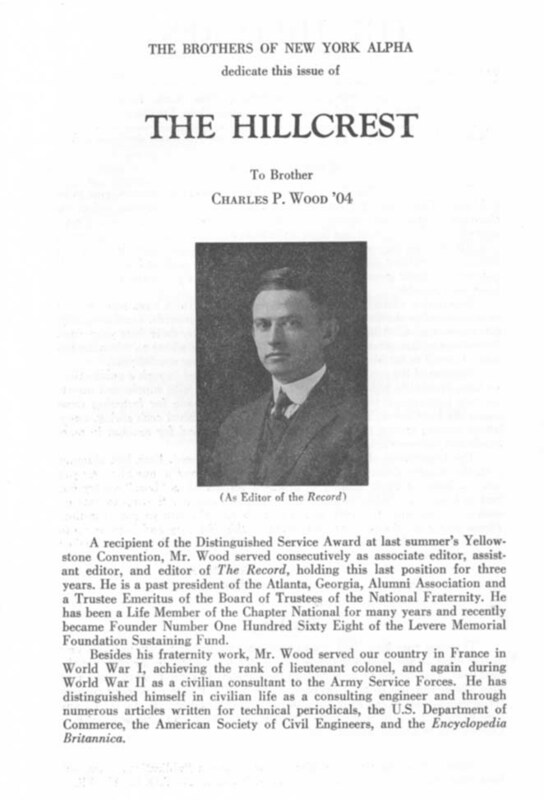 He was chairman of the Financial Code Committee, which formulated the standard accounts of SAE, the first attempt to standardize fraternity finances and which also prepared and published the "Steward's Manual." He was literally drafted into the office of ESA because of his thoughtful attitude toward the fraternity's affairs and his progressive ideas for developing the work. For the discharge of his duties, he joined a rare industry with a singular ability and marshaled an unbeatable array of enthusiasm, vision, judgment, and devotion. His interest in the fraternity has always been keen and active. The records show that since his graduation, he has visited his mother chapter at least once every year with the exception of two years. During those visits, he has devoted time and ability to the constructive measures that have brought his chapter to the occupation of its new $75,000 chapter house. 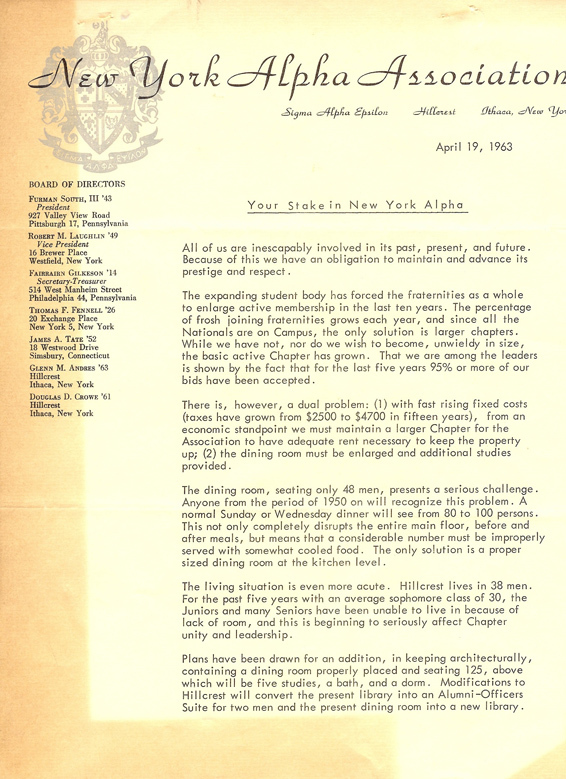 Many of the objects and aims of New York Alpha's Chapter House Association are the product of his fertile mind. He has not been a mere critic, but at all times has remained a constructionist lending his force and influence to progress and ever ready to make a generous contribution in money o the house scheme. In fact, he is the largest contributor of actual money, as befits the resident of the association. His visions reach far into the future, and he sees with a prophetic eye the time when proper administration will achieve a surplus fund in these chapter house organizations sufficient to provide scholarships for the benefit of any SAE who may be "down on his luck" or ambitious for special study in a chosen profession. 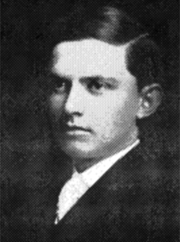 William Levere was the organizer and chief of staff of the great army of Sigma Alpha Epsilon; he planned day and night toward a still greater and better brotherhood among American college youth, but it was Don Almy, the champion in steel helmet and armor, girded for combat, who brought the ideals of Willam Levere to glorious victory and noble achievement. We, his brothers in the bonds, will never forget the logic and eloquence, born of a righteous and noble cause, with which Don Amy carried all oppositions before him on the floor of many of our national conferences, as well as in the forum of interfraternal conferences. He was a Demosthenes, full of fire, eloquence, and persuasive power, while Levere was a Thucydides, the man of historical traditions, of hope, of ideals and ambitions for his people, a great combination of two noble Greeks of which even ancient Hellas could well be proud. Their places cannot be filled. This is no empty phrase or commonplace eulogy, for we of the Supreme Council of Sigma Alpha Epsilon, who worked and lived with these two outstanding leaders of men, day by day and year by year know that William Levere and Don Almy stood like mighty watchtowers on the ramparts of the Greek world. Both men at the time of their passing were members of the Supreme Council. 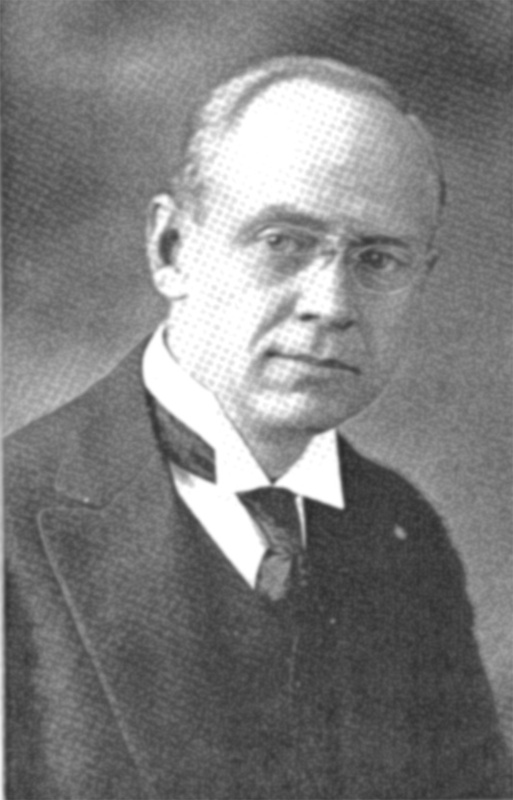 Don Almy had been advanced at the Boston convention in December 1926 to the office of eminent supreme archon, while William Levere had been for many years and was at the time of his death eminent supreme recorder of Sigma Alpha Epsilon. They were among the master builders who laid the foundation for the present greatness of our fraternity, two noble spirits that we hope will live on forever and ever in the memory and traditions of our order. In the summer of 1920 at the convention in Buffalo, during a chat with Don R. Almy, the suggestion was made by him that sometime he would like to see a jewel of appropriate design presented to a retiring eminent supreme archon, province archon, or eminent archon as a symbol or appropriate appreciation for earnest effort on behalf of the fraternity; something of personal recognition; something which might be retained by the recipient and worn by him on appropriate occasions. In later years, Don Almy referred to this idea on many occasions, but his work on behalf of the fraternity ended before it found fruition in the adoption of such a jewel by the fraternity that he loved so well. At the last convention of province alpha, December 14, 1929, Brother Almy's idea bore fruit, a committee being appointed to bring in recommendations and designs for such a jewel. The cuts show the design adopted by that convention for jewels to be presented to each retiring province archon and eminent archon by the province and chapters respectively in province alpha. It is known as the Almy Jewel in honor and remembrance of Don R. Almy. This jewel can be presented to and worn only by past province archons or past eminent archons. It is presented as a reward of meritorious service to the fraternity by its recipient. At the joint Founder's Day banquet of province alpha and the Boston Alumni Association, a past archon's jewel was presented by province alpha to Brother Charles F. Collins, PPA, and past eminent archon's jewels were presented to 16 past eminent archons by the chapters in the province. Each jewel is appropriately engraved on the back of the fraternity shield, a standard form being adopted. 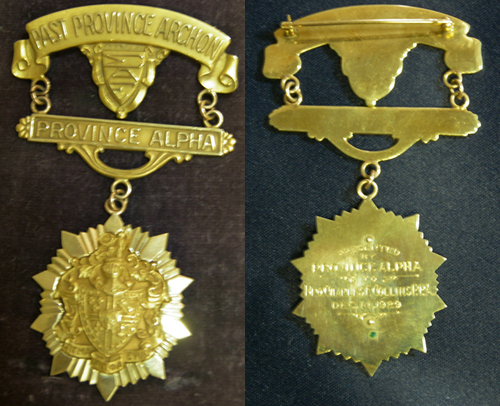 The one presented to Charles Collins being engraved as follows: Presented bt province alpha to Bro. Charles F. Collins, PPA, December 14, 1929. The idea of this recognizing the service of these brothers was highly commended by those present. It is hoped that this custom may be adopted by all other provinces and by the national convention at Evanston in December of this year. NOTE: Now, here is what I found out about the pin numbers, both are correct! I know it sounds odd since Almy is older but in 1896, when he joined the fraternity there were no numbers being put on the badges. That didn't happen until Oct. 1897, so MacElroy who was initiated in 1898 got badge #540. It was not until late 1914 or early 1915 that Almy was issued his number, 12,081. During the 1960s, we had numerous visits from an alumnus who just could not get enough of Cornell University and SAE Hillcrest. 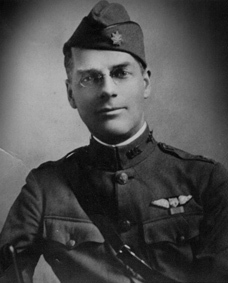 He was Andrew J. MacElroy, class of 1898 and badge number 540, and he was our oldest living alumnus at the time. We never knew exactly when he might show up, but we did know it was always on party weekends. He became quite a fixture (all positive) so we arranged to replace his badge that he had lost somewhere between here and there, and presented a new exact replica badge with number to him at our March Founder's Day Banquet the same night that Fairbairn Gilkeson '14 was honored for 50 years of service to Hillcrest. In Andy's moving acceptance speech that followed he left one message for the brothers! He was about 84 when he started coming back for football weekends and other special events. He and his driver would come up from Long Island and stay at the Statler on campus. They would show up in time for cocktails on Friday and then disappear early Sunday morning for the long ride home. Reports from the campus police were that they failed to negotiate a few turns on campus and drove over more than one curb near the Statler. Chapter Adviser Gilkeson knew Andy from earlier days, and I think he was pleased that an old geezer brother was coming to Hillcrest who was more than 10 years older than "Gilk" was. 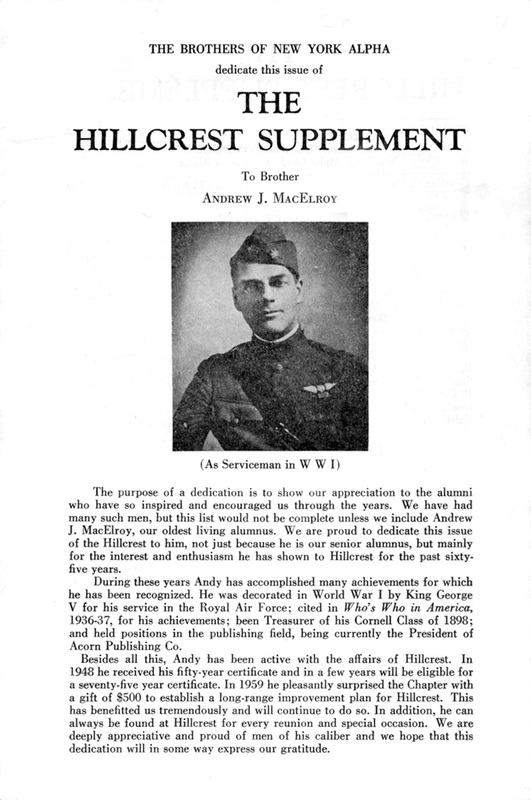 Andy was in the Army and attached to RFA Flying Corp in WWI, flying those biplanes like the Red Baron flew. Imagine that! He was very proud of that experience, as indicated by the picture above. He was decorated in World War I by King George V for his service. Brother MacElroy ran a printing business (Acorn Publishing Company) in Rockville Center, Long Island, New York, and lived there but never forgot his roots in Ithaca at Cornell. PS: Andy's pocket flask was always handy at the cold football games!!! Click here to read a 1961 NY Alpha News story about Andy's Founder's Day badge acceptance. 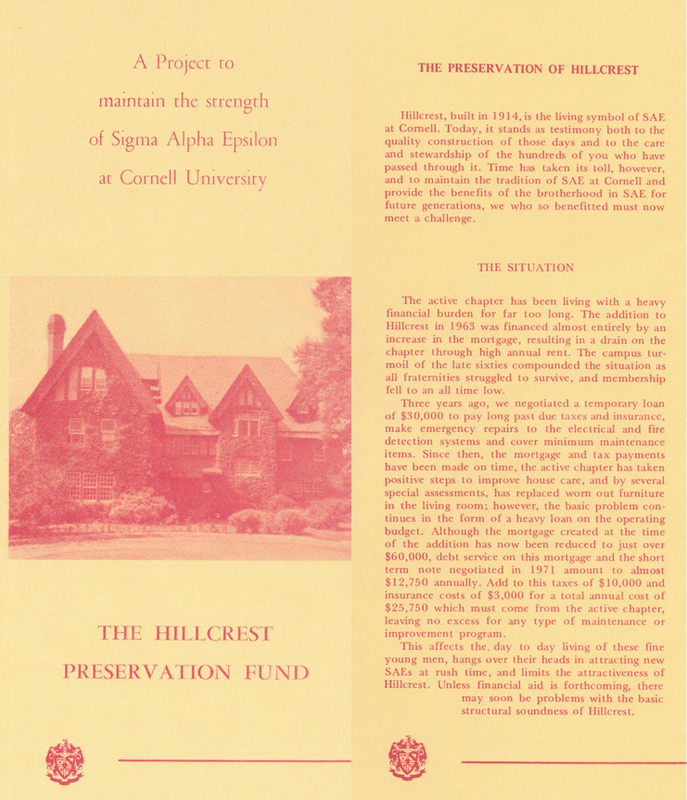 Why Cornell Owns Hillcrest...And Why We're Better Off Today Because of It! Note: As you read this article it is important to read the documents as you go, otherwise you will not see the whole picture. The facts are that it is a much more pleasant task to talk about the benefits of Cornell ownership of Hillcrest than why we got to this position in the first place. But since I have been involved with this from the beginning, I will take a stab at explaining both. It all started in the early 1960s when it was determined that we needed additional dining and live-in brothers to pay the ever-increasing costs to run and maintain the fraternity. The old dining area only seated 48 and there were nearly twice that many brothers. Only 38 lived in and that was with double and triple rooms. Most seniors had to live out, and that was impacting chapter unity and leadership. As a result, plans were drawn up and approved to add a dining room to seat 125 and five more rooms. The addition was not supposed to add materially to the chapter cost of operation, but would generate additional income. The deed was done, and the results simply surprised everyone. As Bob Dean '49 said, "Something has to give." What followed were intense negotiations with the university to have them wave the debt-free transfer of Hillcrest to Cornell. Bob worked on this for a long time, and as you might know, even stepped forward with his own money to keep the house operating until an agreement could be reached. 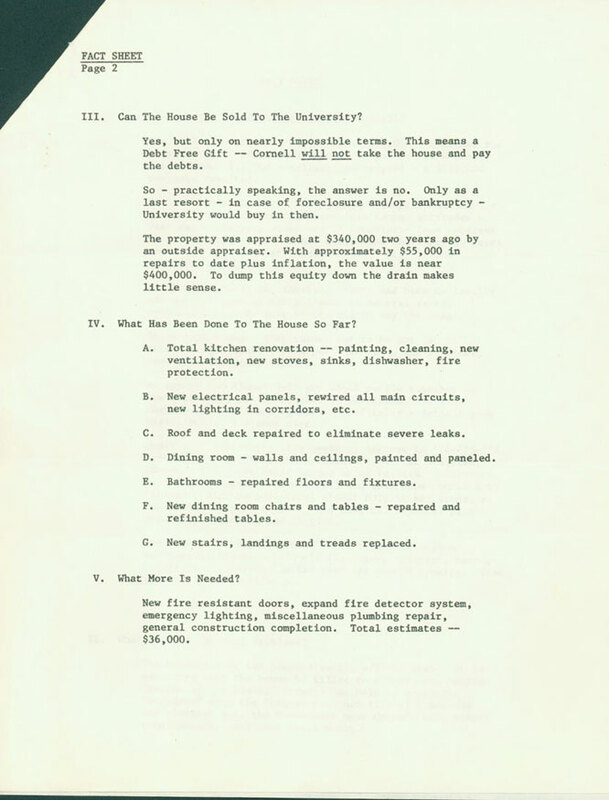 Finally, a transfer was made, and the 1985 Agreement (see archive documents) was endorsed by Cornell, the actives, and the small alumni board that existed at the time. One has to ask--and numerous brothers have asked--whether we could have gotten a better deal. Harris Palmer and I have both concluded (having worked on this for nearly thirty years) that the answer is an emphatic, NO. We simply did not have the means to generate funds to operate and maintain the house moving forward. NO WAY! 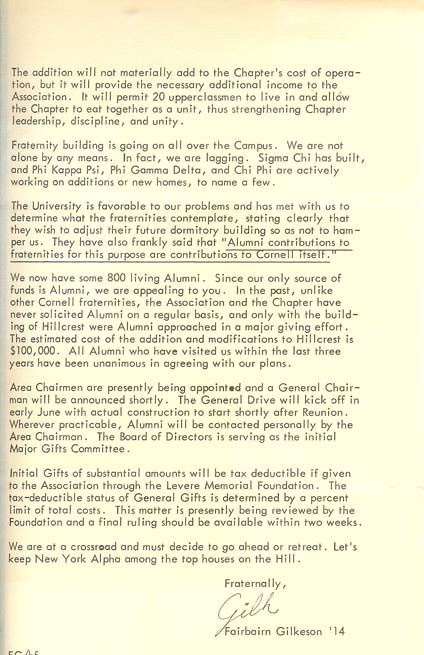 Is NY Alpha Chapter of Sigma Alpha Epsilon better off with Hillcrest being owned by Cornell University? There are a number of reasons that it is good that SAE Hillcrest is owned by CU. First and most significant is that there is a three-member partnership involved with Hillcrest. CU, the actives, and the alumni share in decisions related to Hillcrest. Each of the partners has certain responsibilities. The work load is therefore not overwhelming for any one partner. Donations to the SAE Development Fund are tax deductible. Without this provision, it is unlikely that SAE would have survived and we would have had success raising development funds. Specific active responsibilities include filling the house with live-in brothers, appropriate social activities, academics, normal maintenance, etc. Alumni need to raise money through CU Fund, which gets CU credit as well as SAE Development credit by writing just one check. Additionally, we are to advise the chapter, maintain an active alumni association, oversee the facility improvements, approve other programs that enhance the lives of the actives while they are at CU. Cornell University supports our fund programs, provides programs to enhance cultural development, reports to alumni on finances of the house, provides repairs and maintenance, oversees--where appropriate--the actives in the same manner as for any university housing, and is administratively responsible. By being in this together, we can achieve much more than we could ever expect if the house was still alumni owned. We simply could not have afforded the maintenance over the years if CU did not become the bank. And, if donations were not tax deductible, it is unlikely that the nearly $1 million raised to date under the agreement would have happened. The alumni gain the advantage of having support from CU in many areas. CU gains the advantage of having an active alumni group. The actives gain the advantage of support from both alumni and CU. CU ownership is beneficial to SAE. There are no property taxes for us to pay. There is no fire/casualty insurance to pay. We can get loans from CU. And, as mentioned earlier, tax-free alumni giving results since CU is a 501(c)(3) organization. However, the alumni must fund capital improvements and maintenance and repair of Hillcrest. And, we must use union labor. Why? CU does not charge us rent for use of the house. Instead, we are asked to maintain the property. That seemed like a good deal when Hillcrest was turned over to CU and it still is. 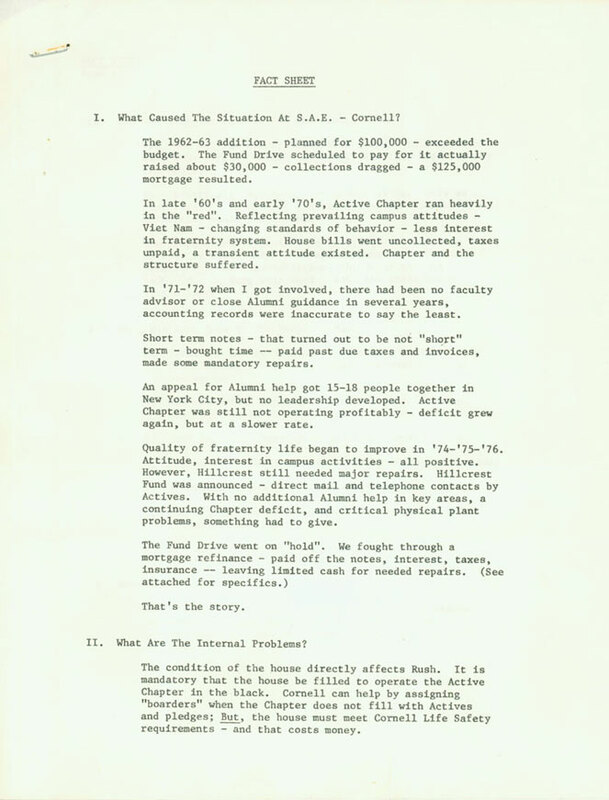 Since the founding of the Cornell chapter in 1891, SAE has had four homes. 804 E. Seneca St. (1900 to 1902) The chapter probably rented this house, which still stands. 801 Stewart Ave. (1902 to 1911) This house was purchased in 1902, the year that the New York Alpha Association of Sigma Alpha Epsilon was incorporated. It stood on the site of the present house and was called Hillcrest by its owner, botany professor Albert Nelson, who died in 1896. His widow, Adeline E. Prentiss, ran a boarding house, offering "rooms at Hillcrest, off University Avenue," until she sold the property to SAE. The original Hillcrest was totally destroyed in a spectacular fire on June 10, 1911. Fortunately there were no deaths or injuries. 113 Oak Ave. (1911 to 1915) This was the temporary home of the chapter while funds were raised and plans prepared for a new Hillcrest. It is now a cooperative living unit called "The Shire." Today's Hillcrest (1915 to present) Brothers Ralph S. Kent '02, Edward A. Wadsworth '04, and William H. Marland '01 were instrumental in the construction of the new Hillcrest. A new (south) wing, extending towards Alpha Delta Phi, was added in the late 1960s through the efforts of Doug Crowe '61, a US Army Captain who died in Vietnam. Hugh Zimmers '59, was the architect. The late Fairbairn Gilkeson '14, chapter adviser for many years, arranged the financing and oversaw the project. "Original" Hillcrest on Stewart Ave.
1911 -- SAE House At Hillcrest Totally Destroyed By Fire! The stately and beloved SAE house, Hillcrest, which crowns the prominence above Stewart Avenue on the south bank of Fall Creek gorge, was totally destroyed by a fire which consumed all of the personal property of the brothers. Fortunately, only two SAEs were in the house, and they escaped safely with no loss of life or injury. Records, photos, and some first-floor furniture, including a grand piano, were saved by brothers of neighboring Alpha Delta Phi and nearby residents. The fire was started by crossed electrical wires and set off an automatic fire alarm system. The flames had a good start before the firemen arrived. They were hampered by low water pressure and the steep wooded slopes on three sides of the property. Like a bonfire on the summit of a mountain, the glaring red flames from the blazing building lit up the city and surrounding countryside. It was seen at a distance of 25 miles up the lake. When Chief Burns realized that SAE was going to be a total loss, the firemen directed hoses at Alpha Delta Phi to prevent the flames from jumping the gorge. The blaze continued from the start at around 9:00 p.m. thru midnight, fought by all six area fire companies, and finally extinguished by a sudden thunderstorm. The fraternity plans to use the $12,000 in expected insurance proceeds to anchor a new mortgage and build a new, fireproof structure on the magnificent site. For more information see the June 12, 1911, Ithaca Journal and the September 1911 Record of Sigma Alpha Epsilon.